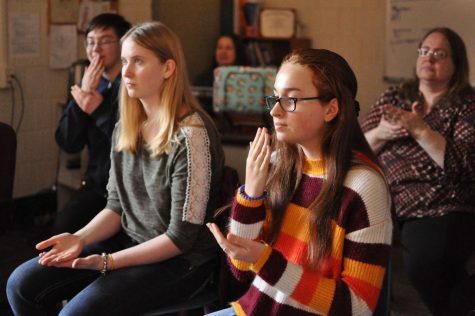 Despite the stress brought on by beginning her freshman year of high school, Zoe Miller-Zeller was cast in one of two one-act plays, Tracks. Miller-Zeller was thrilled to be cast as the High School Girl, especially as a freshman. “My intent going into auditions was to do it for the experience of auditioning and the hope that I would make it into any of the three [plays], and be happy with any role I was given if cast,” Miller-Zeller said. Miller-Zeller is also a Speech Team member and said it is a struggle balancing homework, memorizing lines, and practicing her speeches. Emily Houston, a junior and fellow theater member, has experienced this same challenge of balancing school work and rehearsals. “I think that she is being so mature and handling [theater] very well. Being in theater is a lot of responsibility and she’s doing a great job!” Houston said. Miller-Zeller said that acting can be quite nerve-wracking, especially since she’s a self-proclaimed introvert who likes to stay in her comfort zone. However, she is able to overcome this fear while on stage performing. “The second I go on stage and get engaged in what I am doing the nerves disappear,” she said. Cast mate junior Peyton Tongate said Miller-Zeller is a pleasure to work with on and off the stage. As an upperclassman, Tongate finds it easy to mentor Miller-Zeller and said she takes criticism very well. She hopes that Zoe finds her home in theater and develops great relationships in the process.